WordPress 4.7 Update Released - This is a Big One! WordPress 4.7 is finally here for public release. We at ProWP, and I’m sure most other WordPress developers, have been looking forward to this particular WordPress update for a while. Our favourite new feature of WordPress 2.7 is the Custom CSS option found within the Theme Customiser. 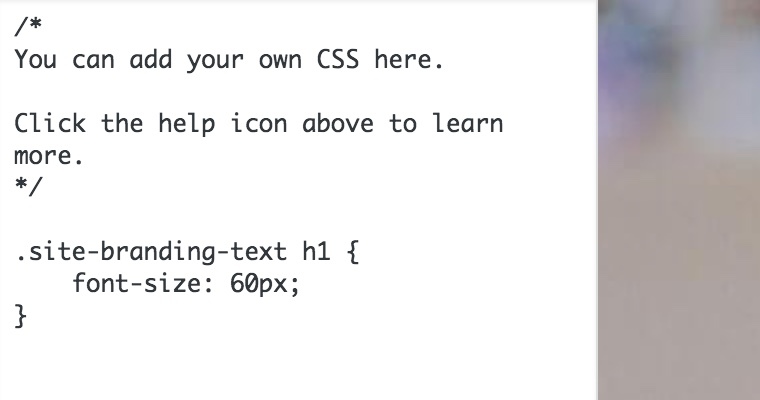 Editing the CSS allows you to change (via CSS code) how the site looks. When a client approaches us for some aesthetic tweaks on their website we’ve traditionally had two options to proceed. If they’re not already using a Child Theme we’ll go to the effort of creating and setting up a Child Theme for them, and then applying the tweaks they have asked for. Although this is a good, safe approach to getting things done, it adds time to the process. And time equals money. Sometimes clients have a very strict budget – in which case we’ll bypass the Child Theme creation, and skip straight to installing a third-party Plugin that enables us to edit CSS (and so make the requested changes). But now, the option to edit CSS is right there in the WordPress core functionality – which means no more third-party plugins, and no more need to create a Child Theme should the budget not stretch that far. And best of all for you – reduced time needed to make any changes! We’ve written an additional blog post about this Additional CSS option with examples of WordPress CSS that you can use on your own website. Although in all circumstances we cannot stress enough just how important having a Child Theme is. This Custom CSS feature is a step closer to eliminating the need for Child Themes, but they’re still incredibly relevant should more extensive Theme customisations be required. A very small change, but tremendously useful. 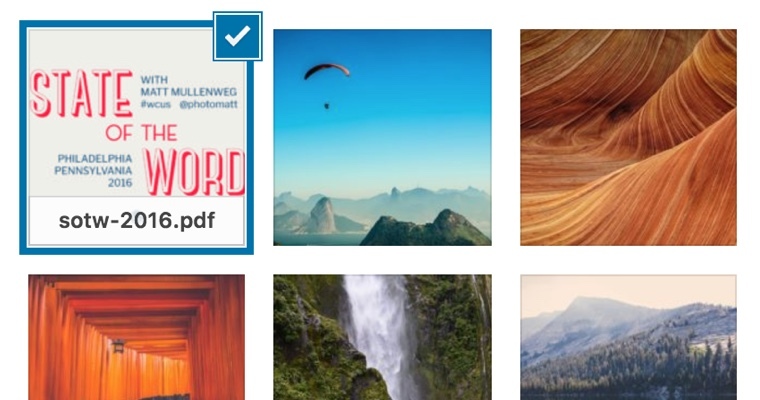 You can now see a preview of every PDF file you upload in the WordPress Media gallery! I know this is going to be very useful to quite a number of our clients who have traditionally had to remember the name of the PDF should they wish to find and reference it multiple times. Now it’s just as simple as taking a peek inside your media library. Do note that this function relies on you using a compatible server – this will not work for everybody. Existing PDF files already in your library may not show thumbnails either, it may only apply to newly uploaded files. To help give you a solid base to build from, individual themes can provide starter content that appears when you go to customize your brand new site. Perhaps not quite as useful to those who have an existing website, but should you ever wish to create a new WordPress site, the new Theme Starter Content is going to prove quite the time saver. Traditionally you (or your developer) would have to install a Theme and then use educated guesses on where best to place certain modules and widgets. Now that these starter content placeholders have been added, you simply update them with your own information. Quite the looker, this Theme. Every year the WordPress core developers release a new ‘flagship’ Theme released free with a major update – you may have seen previous versions with this naming system installed as default in your own WordPress site – ‘Twenty Twelve’, ‘Twenty Thirteen’ etc. Although certainly not suited for every website, you can’t deny the huge header images featured throughout the site demand attention. If you feel your site suits this particular aesthetic, then you certainly can’t go wrong with the Twenty Seventeen Theme developed by WordPress themselves. A small change, but perhaps very important depending on how you write text on your website, is that the Editor box has been modified slightly. You can no longer Justify or Underline text using the buttons in the editor as they’ve been removed. The icons have had a slight shuffle around too, but all the important key functions are still right there in the toolbar. We feel the features we’ve highlighted here are the most important things to come out of this update from a ‘regular user’s’ perspective. But there are a TON of additional features that are going to make our lives as WordPress developers easier. As always, if you need any assistance updating to WordPress 4.7 on your own website, please do reach out – we’d love to help!